If any team want to win the title of IPL then the batting lineup needs to be the strongest part of the team. So here we check about the IPL Top 5 Teams with Strong Batting lineup. All teams have made some changes in the Auction of IPL 2019. Many surprising bidding happened and we will check today that whos batting lineup became better than before. Which team has the strongest batting lineup for IPL 2019? Check below the list of IPL Top 5 Teams with Strong Batting lineup. At the top of the list of IPL Top 5 Teams with Strong Batting lineup, we have last year's champion Chennai Super Kings. CSK has the best batting lineup in the IPL 2019.CSK has players like Suresh Raina, Faf du Plessis, Ambati Rayudu, Shane Watson, Kedar Jadhav, Sam Billings, and most the important Mahendra Singh Dhoni. All the players are in good form. CSK has the best all-rounders like Dwayne Bravo, Ravindra Jadeja, Mitchell Santner, David Willey and Deepak Chahar. So if you take a look at the batting lineup of Chennai Super Kings, they have a depth in their batting having both young and experienced players. Royal Challengers Bangalore seems to be very well balanced in IPL 2019. So at the second position in the list of IPL Top 5 Teams with Strong Batting lineup, we have RCB. Virat Kohli is the captain of this team and everyone knows what kind of player he is. RCB also has batsmen like AB de Villiers, Parthiv Patel, Shimron Hetmyer, Heinrich Klaasen. RCB has the best all-rounders list among all teams in IPL 2019 such as Shivam Dubey, Marcus Stoinis, Pawan Negi, Moin Ali, Washington Sundar. So they give very good support to the batting order of RCB in IPL 2019. Kolkata Knight Riders come on number 3 in the list of IPL Top 5 Teams with Strong Batting lineup. KKR has very good batsmen like Chris Lynn, Robin Uthappa, Shubhman Gill, Nitish Rana and, Dinesh Karthik. Also, they have all-rounders like Sunil Narine and Andre Russell, who are very destructive batsmen. KKR bought a new all-rounder in the Auction of IPL 2019 who is Carlos Braithwaite. So overall KKR has a good batting lineup for IPL 2019. Talking about the number 4, we have Delhi Capitals in the list of IPL Top 5 Teams with Strong Batting lineup. Delhi Capitals is full of the youngsters and the batting lineup is very strong in IPL 2019. The biggest change which happened in Delhi Capitals is Shikhar Dhawan. DC traded Shikhar Dhawan from SRH and it will boost up Delhi Capital's batting lineup in IPL 2019. DC has players like Rishabh Pant, Shreyas Iyer, Colin Munro, Prithvi Shaw, Colin Ingram who are in good form and will give a strong batting lineup to DC. Also, they have hard-hitting all-rounders like Axar Patel and Chris Morris. So Delhi Capitals comes in the list of IPL Top 5 Teams with Strong Batting lineup. On the number 5 in the list of IPL Top 5 Teams with Strong Batting lineup, we have Mumbai Indians. MI has a strong batting lineup for IPL 2019. Mumbai Indians has very good batsmen like Rohit Sharma, Quinton de Kock, Evan Luise, Suryakumar Yadav and, Ishan Kishan. Apart from that, MI has very good all-rounders like Hardik Pandya, Krunal Pandya, Ben Cutting, and Kieron Pollard. So if you look at the batting lineup of the Mumbai Indian, MI has a very strong batting lineup for IPL 2019. So that was the list of IPL Top 5 Teams with Strong Batting lineup. This list is based on the players who will be playing in IPL 2019. 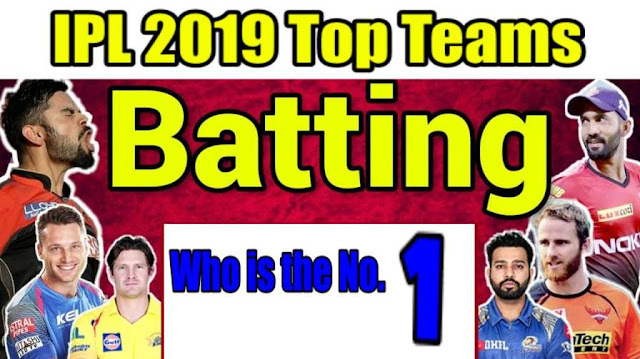 What do you think which team has the strongest batting lineup in IPL 2019?